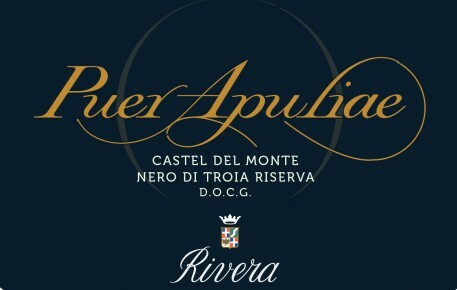 The cru ‘Puer Apuliae’ is Rivera’s top shelf wine made with 100% ‘small berry’ Nero di Troia grapes, an extremely rare clone selected from Rivera’s oldest vineyard ‘Tufari’. Located t an altitude of 250 meters at the foot of the Murgia hills (northwest of Bari), with very poor calcareous soils, the Tufari vineyard is trained to spurred cordon at 4,800 vines per hectare. Average yield is 50-60 quintals per hectare. Nero di Troia (also called Uva di Troia) is the third most important of Puglia’s native black grape vines, after Negroamaro and Primitivo. Puer Apuliae takes its name from the Latin for ‘Son of Puglia’, the nickname given to Frederick II of Swabia, the 13th century Emperor of the Holy Roman Empire who loved this region so much to make it his summer residence and to build the famous octagonal castle (Castel del Monte) which later gave its name to the surrounding DOC area and it is now a UNESCO World Heritage site. Deep red in color, it is a wine of considerable character and style: modern vinification techniques and ageing in new barriques have enabled Rivera to maintain the typical fresh aromas of dark berry, violets and star anise, while taming the tannins into a concentrated, full-bodied palate. It should be paired with full-flavored, rich dishes such as red meat, roasts, game, meat with flavorful sauces and aged cheeses. Serve at 65F, uncorking the wine a few hours before serving or decant. If cellared properly, Puer Apuliae will age beautifully for at least 12-15 years. Spurred cordon system at 4,800 vines per hectare. Average yield is 50-60 quintals per hectare. Harvest takes place between the last week of October and the first week of November. Maceration in stainless steel lasts 20 days, with frequent pump-overs and delestage for maximum extraction of aroma and color compounds. Micro-oxygenation softens the tannin content. The wine undergoes malolactic fermentation in new French oak barriques, where it matures for 14 months. It is not cold stabilized nor filtered. It is given a further12 months’ bottle ageing before release.